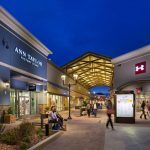 Nestled in the mountains of Asheville, NC, Asheville Outlets is an open-air center that features over 70+ outlets and include name brand favorites: Coach, J.Crew Factory, Brooks Brothers Factory Store, Vera Bradley Factory Outlet Store, RH Outlet, Cole Haan, Dillard’s Clearance Center, Field & Stream and MORE! Shoppers enjoy savings up to 70% off (store offers vary). Asheville Outlets also features covered breezeways that provide natural airflow, a beautiful fire and water fountain, fire place soft seating areas and year-round events (Food Truck & Craft Beer Festival, Kids Days, Car Shows, etc.). 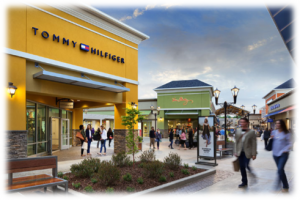 There is something for everyone at Asheville Outlets from women’s and men’s favorites at Tommy Hilfiger, Johnston & Murphy Factory Store and Under Armour, to children’s brands at Carter’s Babies & Kids, The Children’s Place, Gap Factory Store and Justice. For must have footwear: Famous Footwear, Rack Room Shoes, ASICS, New Balance and more! Asheville Outlets is conveniently located at the intersection of two major interstates – I-40 and I-26 at Brevard Road (Route 191). To keep up-to-date on all the happenings at Asheville Outlets, follow on Facebook and Instagram @ashevilleoutlets and Twitter @shopasheville. Or, visit us online at www.shopashevilleoutlets.com.